Siegfried is the third in Wagner’s four opera Ring cycle. Presented in a hardbound volume with colour production photos and essays on the opera, together with a full libretto. This new premiere SACD hybrid surround recording features the combined talents of the State Opera of South Australia, the Adelaide Symphony Orchestra and a stellar cast conducted by Asher Fisch. The four operas of approximately 16 hours duration is the world’s first 6-channel super audio CD (SACD) recording of The Ring in surround sound. The significance of this was noted in the January 2005 editorial of Gramophone magazine. It is a lasting tribute to the outstanding Adelaide production of Wagner’s masterpiece and to the predominantly Australian cast. The $15.3 million production blitzed the 2005 Helpmann Awards, winning ten of its eleven nominations and earning critical accolades. Wagner’s quest to find an archetypal hero figure for his operas – a figure well-known from mythology but one whose actions would not seem outdated to audiences in the rapidly changing world of the late 1840s – soon led him to Siegfried, the dragon-slaying folk hero of Norse and German legends. He wrote the libretto for a relatively straightforward romantic opera about the death of Siegfried, the work we now know, with some later changes to Act I, as Götterdämmerung. At first he hesitated about going further with Siegfried onstage while other ‘heroes’ – Achilles, the medieval German king Frederick Barbarossa, even Jesus Christ – competed for his attention (Wagner sketched dramas for music about all three). 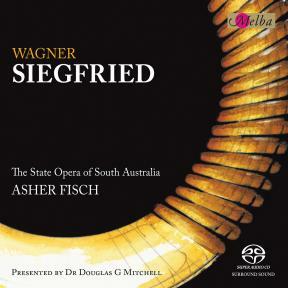 Finally, a belief that the figure of Siegfried could be both the most modern hero and the most suitable for the new style of ‘music drama’ he now wanted to write, encouraged Wagner to develop the story of Siegfried’s Death by going backwards into the famous events of his earlier life. Also called Sigurd or Sigurth, the character of Siegfried has many of the classic heroic attributes. He never knows his semi-divine parents and is brought up in the wild by a foster-father (Mime). He has been left a gift which will ensure his fame and fortune (the pieces of a sword). A tendency to rough behaviour (ill-treatment of Mime) leads him to seek adventure in the outside world (killing Fafner the dragon) in the course of which he acquires some supernatural knowledge (tasting the dragon’s blood lets him understand birdsong and hear Mime’s thoughts). The traditional mythical outcome of such a story is for the hero to return home, free his mother from oppression and become the new ruler (as does Oedipus, for example) – events not literally followed by Wagner but with obvious parallels in Siegfried’s discovery and wooing of Brünnhilde (whom he thinks at first is his mother), his marrying (in Götterdämmerung) into Gibichung ‘royalty’ and the intention of Wotan that he should be a ‘free man’ who could regain the lost ring (and moral power) for the gods. When writing the text of The Young Siegfried as the opera was first called (and unlike the later Das Rheingold and Die Walküre where a coherent narrative and text had to be assembled from many sources), Wagner could rely on an already extant story which existed complete in two Nordic mythological texts. In the Volsung Saga (widely available today in good English translation) and Thidrek of Bern’s Saga he could draw from a detailed account of the day-to-day life of the young orphan growing up with the malevolent foster-father he will later kill. Also, an early 19th century German play about Siegfried (or Sigurd as the Norse tales called him), Fouqué’s The Hero of the North, provided him with a ready-made three-act scenario of events. So in Siegfried – more than in the other Ring operas – we find text lifted almost wholesale from its sources, an anticipation of the working methods of later 19th and 20th century librettists. will you not greet a guest? He eventually wins by asking a question to which only he (Odin) can know the answer. forced the dead witch to rise. Neither likes what they hear and they end by reproaching each other in words Wagner again took over almost exactly: “Du bist – was du dich nennst!” (“You are not what you declare!”) Wagner based his Erda’s appearance on the earth goddess of another Edda poem where Odin woos a maiden who will bear him a son to avenge the death of Baldur – just as Erda’s daughter Brünnhilde brings back heroes for Valhalla in Die Walküre. From his other favourite reading Wagner also incorporated touches from the many adventures of Zeus in disguise and Shakespeare’s Duke in Measure for Measure into Wotan’s encounters with Mime, Alberich and Siegfried. When Wagner modified The Young Siegfried – originally planned as merely a ‘prequel’ to Siegfried’s Death – to become the third part of the Ring tetralogy, he made some important developments in the character of his hero. beaten – slave and uncomprehending teenage thug, these verbal abuse and threats are every bit as violent in Fouqué’s Sigurd play and other German sources. Then there was the question of how (or if) the young Siegfried will learn fear. Told by Wanderer after the riddling contest that his head is forfeit to one who knows no fear, Mime rightly worries that Siegfried is this person and attempts (in vain) to frighten him with wild-wood horror stories. At the close of Act II, Siegfried realizes, “Der dumme Knab’, der das Fürchten nicht kennt, mein Vöglein, der bin ja ich!” (“A foolish boy, unacquainted with fear, dear woodbird that is me!”) In Act III, when he is sexually aroused by the sight of the sleeping Brünnhilde, he wonders if this new emotion is fear, but soon after acknowledges that he has never learnt it. In Götterdämmerung this lack of fear – which implies a lack of true maturity (one of several areas where Wagner’s psychological characterisation appears to anticipate end-of-the-century psychoanalytic research) – will prove Siegfried’s undoing. Devouring everything he could find by the Brothers Grimm, both for information about the old legends and for what one might call psychological hints, Wagner drew Siegfried’s fear problem almost exclusively from their work. The Grimms, for example, had noticed the parallel between Siegfried’s nervous awakening of the sleeping Brünnhilde and the Sleeping Beauty fairy story. Yet it was only after the first draft of Siegfried was written that Wagner claimed to see (or confessed to?) the link between his hero and their story The One Who Went Forth to Learn Fear. The character of Wotan, substantially created after Wagner created that of Siegfried, threatened to rival that of the young hero in importance in the finished Ring cycle. In his decision to renounce power to Siegfried, yet still to try to bar his way to Brünnhilde’s rock, Wotan is like Christ in the garden of Gethsemane – human enough to want to avoid his fate. The colour of his cloak (blue) is mentioned in the Eddas, but it is a colour always associated with the Virgin Mary. If the text of his scenes with Alberich and Siegfried are taken at face value – for example “Zu schauen kam ich, nicht zu schaffen …” (“The Wanderer watches, takes no action …”) – this god’s progress shows a resignation as Christian as it is Buddhist or Schopenhauerian. Wotan’s meeting with Alberich in Siegfried Act II has no equivalent in the old stories Wagner researched but was obviously dramatically irresistible – rather like Schiller and Donizetti placing Elizabeth I and Mary Queen of Scots in head-on (but unhistorical) confrontation. Wagner naturally sensed a parallel between Alberich and Wotan, the compromised leaders, and their supposedly free sons Hagen and Siegfried, and had Wotan call himself ‘Light Alberich’ in acknowledgment that both men are playing the same power game. Who summons me from sleep? Hail to night and its daughter. The remainder of the old poem, incidentally, is taken up with the runic wisdom that Brynhild gives to her hero, including advice about surfing. About the Woodbird itself, Wagner – who had researched its song, Messiaen-style, in a valley in Switzerland – left a dark hint that there was a clear link between it and Siegfried’s mother, Sieglinde.